Thirteen original meshes and 43 unique, historically accurate texture, bump, and reflection maps bring what President Roosevelt called "the most historic street in America" to life in your artwork. Meshes, uvs, textures, and poser files optimized for efficient rendering and animation. The light probe images match the specular color and reflection map in the image shaders for added realism. The planks, boards, muntins, and ironwork are modeled. The Apothecary: Sign of the Rhinoceros and the Dubois Grocery are authentic and suitable for any scene from 1776 to the 1860's to the present. The signs are seperate props (included) so you may interchange them or use on other buildings. Also included are a number of barrells and planks, plus a section of picket fence. In addition, the materials allow for easy interchangebility of shaders, so you may use any of the textures and shaders on each building, to greatly expand the number of buildings in your town from just a few models. The props may be used for any scenes requiring an eighteenth-century city or domestic scene. 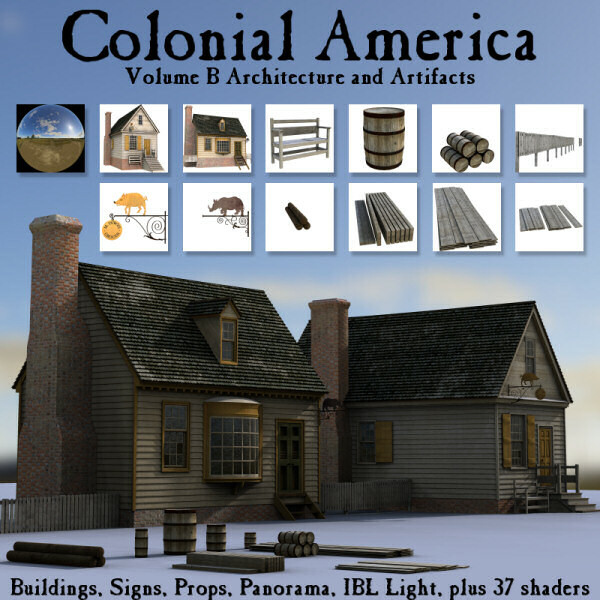 You can fill the city with colonial buildings and recreate the American Revolution or place it on the frontier from Florida to Canada. These buildings were present at the time of the founding of the United States, the city also saw two Civil War battles. George Washington, Thomas Jefferson and Patrick Henry knew these buildings.